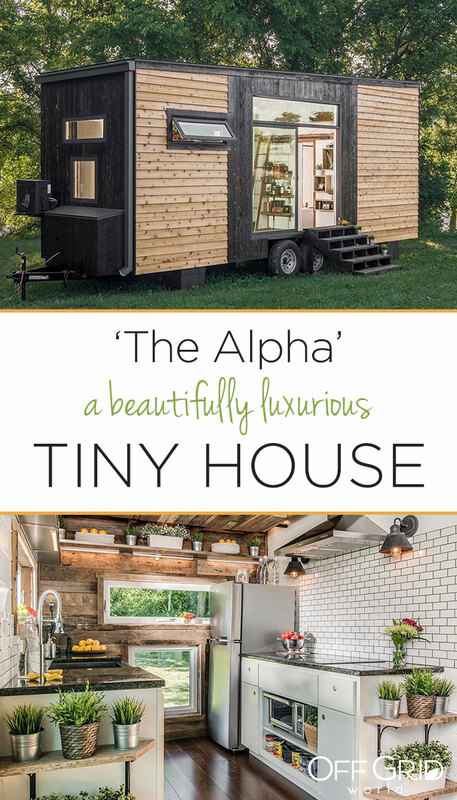 The Alpha is a gorgeous tiny house built by New Frontier Tiny Homes in Nashville, TN. The modern and fully functional interior is beautifully lit with plenty of uniquely-placed windows and glass doors. At about 190 square feet, this home is one of the most beautiful models we’ve seen, and it’s packed with creative storage areas and unique features. The home is clad in contrasting red western cedar and charred black/grey cedar siding, a stunning combination presenting both modern and rustic aspects. Inside this stunning home, one of the most prominent features is the abundance of windows on every wall. 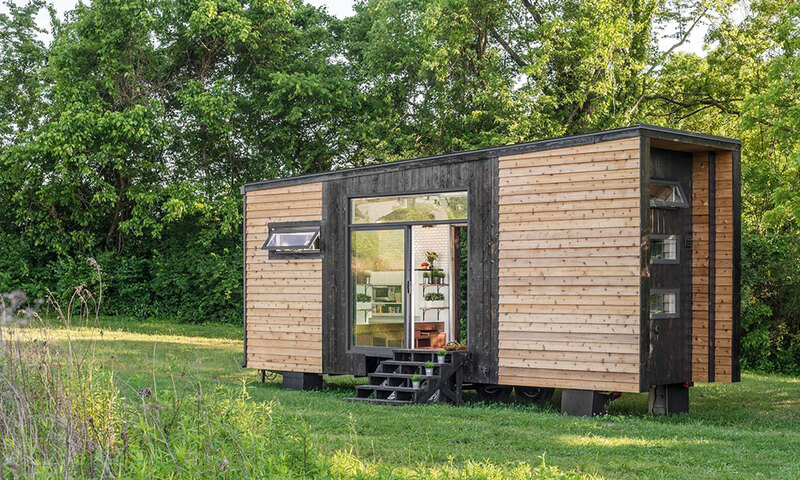 Besides the large sliding door and windows on one side, smaller windows are packed into each end wall from top to bottom. 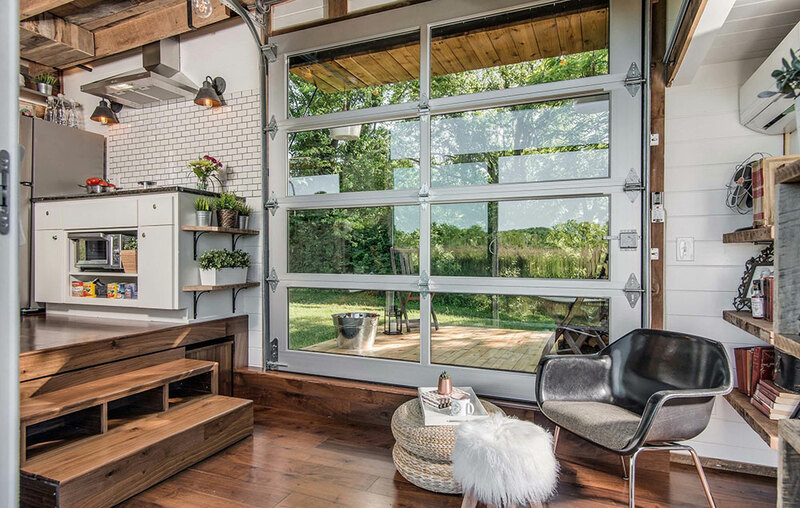 The other side wall holds a tempered glass garage door that can be rolled up to open that side of the home to the outdoors. 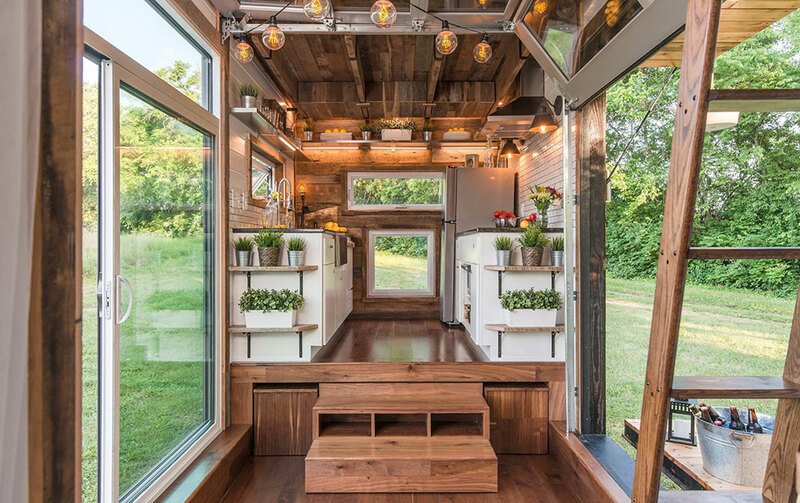 The area outside the garage door holds a drop down deck and awning that provides a beautiful outdoor living space. 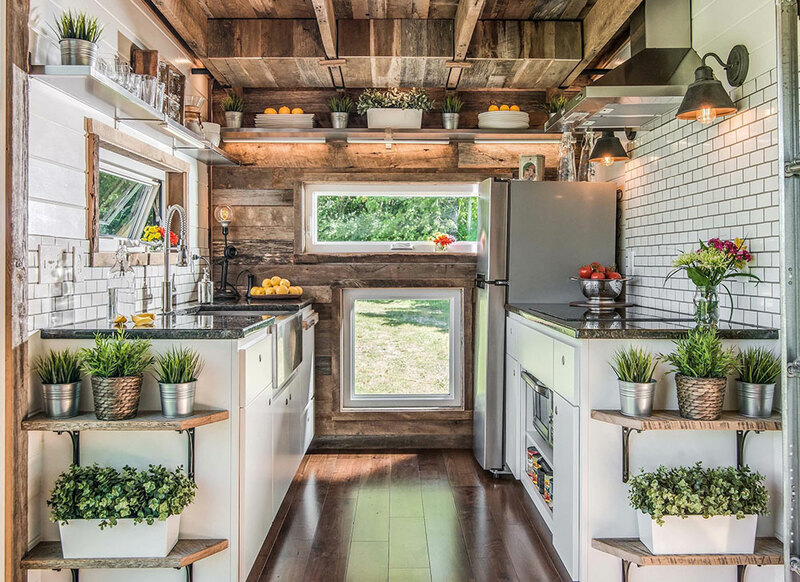 The wood ceiling and end walls inside the Alpha tiny house come from reclaimed barn wood. Opposite the ceiling, the solid walnut hardwood floor is a classy complement to the barn wood. 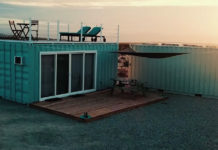 The kitchen holds a stainless steel sink and fridge, a built-in cooktop, a toaster oven, and a dishwasher. Drop down kitchen cabinets, stainless steel shelves, and wood shelves offer plenty of storage space. The countertops in the kitchen are finished in gorgeous granite, while the white walls and cabinets brighten up the space. The loft bedroom is accessed by a custom oak library ladder that can be hidden under the kitchen stairs when not in use. Many other unique storage areas and features can be found within the home, including a foldaway table with benches that pulls out from beneath the stairs. A pocket door at one end of the home leads into the bathroom. One side of the pocket door features as full length mirror. 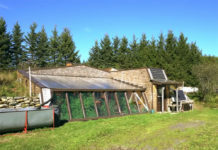 The bathroom includes a composting toilet, a jacuzzi tub and shower, and antique mirrors above the vanity. It also holds the clothes washer/dryer combo. 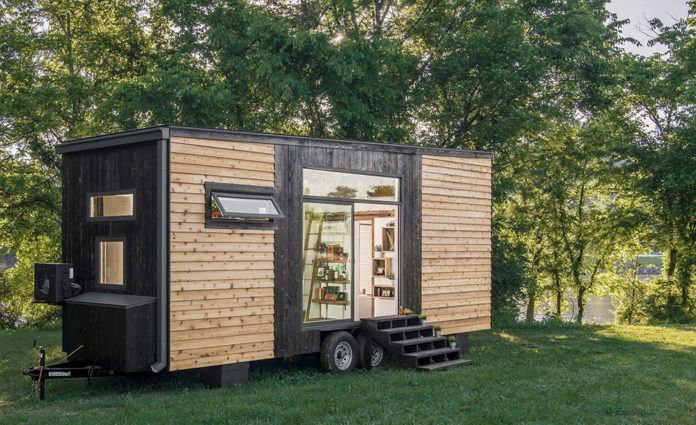 The Alpha tiny house is definitely one of our new favorites. 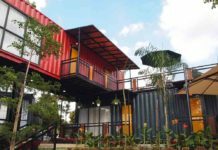 It is a perfect example of luxury living in a tiny space.